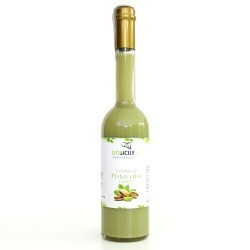 The pistachio liqueur is excellent after coffee, lightly alcoholic with a creamy texture. It is appreciated by non-habitual drinkers. It has a unique and unusual taste and it becomes an excellent after-dinner drink or a tasty drink to enjoy with friends. You can combine it with a slice of pistachio cake from DOSicily.com or with a delicious nougat and crunchy. The creamy pistachio liqueur represents the delicious aroma of Sicily, to surprise and delight your guests. Pistachio Liqueur There is 1 product.